NewsPlus: Hayley Fahey discusses her upcoming album, 'OUT THERE', available April 28. The singer/songwriter, Hayley Fahey, was back in the NewsPlus studio to talk about her latest album, OUT THERE. A release party will be held at the Villain & Saint in Bethesda, Maryland on April 28th. NewsPlus: Hayley Fahey talks new album 'Sweet Red' and more. Hayley Fahey joined Mark Segraves in studio to discuss her musical career, including her side hustle of video production. Check out the interviews below! Watch Hayley perform 'Tuesday Morning' here. 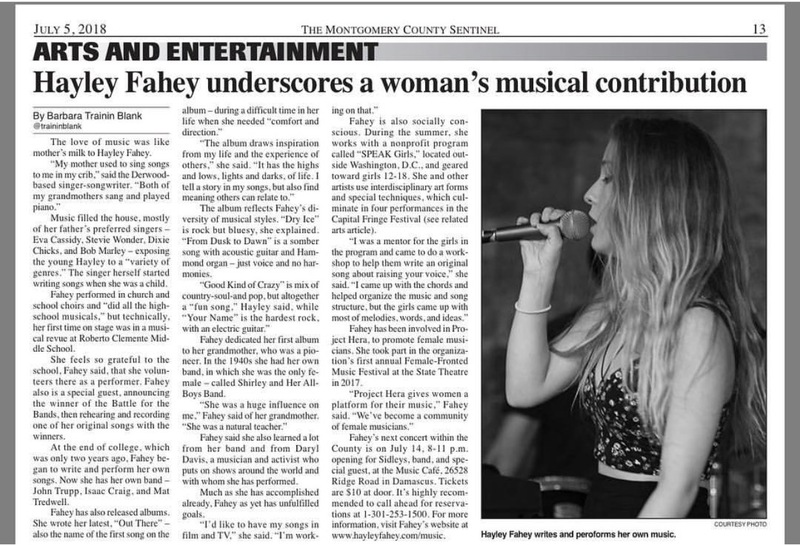 Hayley Fahey brought her big, soulful voice to Gypsy Sally's Vinyl Lounge on July 14, and although the audience turnout was somewhat disappointing, that didn't distract from a crisp, fun show that showcased her powerful songwriting and a few spirited covers. By Ally Schweitzer Songs featured Sept. 13, 2016, as part of Capital Soundtrack from WAMU 88.5.Read more about the project and submit your own local song. GAITHERSBURG, MD – Singer-songwriters and poets will share their talents at the 9th Annual Gaithersburg Book Festival, taking place from 10 a.m. to 6 p.m. on Saturday, May 19. While enjoying these performances on the Marvin Gay Stage, festival goers also will be able to enjoy gourmet snacks, coffee, and beer and wine from local breweries and wineries at the Brew & Vine Café, hosted by Dawson's Market.